Identification of 1st cycle Iceland and Kumlien’s Gull. Although the exact taxonomy of Iceland Gull and Kumlien's Gull is under debate (see Weir, 2000), it may still be interesting to try to classify birds, especially single out-of-range birds, in the field. This is not possible in 'every' bird, but the most extreme birds in the spectrum surely deserve a try. Of course, caution is needed in much of what follows below, as there are hardly ringing/banding programmes on juveniles (read nestlings) of both taxa/forms, hence the frame build on observations in winter is questionable. However, the law of large numbers may apply, with plenty observations and photo documentation from the two wintering grounds, and at least some 1st cycle birds can be classified. glaucoides, December 04 2011, Fraserburgh, Scotland. Picture: Chris Gibbins. Classic bird at the pale end of the spectrum. Note that outer primaries are paler than inner primaries, and pattern on both inner and outer primaries consist of much spotting near the tips. Outer primaries not obviously darker than inner pirmaries, rather the contrary. kumlieni, February 10 2012, Duxbury Beach, MA. Picture: Rick Bowes. Claccic bird with outer primaries darker than inners and dark pattern runneing down all the way to the tips which have no diamond-shape or chevron. glaucoides, December 03 2007, Scheveningen, the Netherlands. Pictures: Mars Muusse. Darker end of the spectrum with obvious grey wash. Still, there is much spotting and transversal lining near the feather tips and spotting on the inner webs. Inner primaries darker than outer primaries. kumlieni, February 21 2009, Winthrop Harbor, Lake Co., IL. Picture: M.L. Retter. Overall dark bird, still, note absence of spotting and vermiculation near primary tips when compared to darker end glaucoides. glaucoides, February 26 2012, Peterhead, Scotland. Picture: Chris Gibbins. Rather dark-winged, with the outer-webs of the primaries all darker than inner ones. Still, there is a uniform pattern, as this pattern is repeated across all primaries, with inner ones darker, if anything, than outers. kumlieni, December 11 2011, Mount Desert Rock, Maine. Picture: Luke Seitz. Difficult bird, when seen in out-of-range location. Outer primaries just darker than inners, but every primary tip with obvious diamond shape like in glaucoides. glaucoides, February 06 2008, Peterhead, Scotland. Picture: Chris Gibbins. Pale outer primaries. Arrow points at outer primaries probably faded away by February, but still visible on inner ones. Note pale outer-webs of outer primaries. kumlieni, January 20 2013, Michigan City, IN. Picture: Amar Ayyash. Classic bird with smooth texture on primaries, lacking spotting and chevrons near tips. 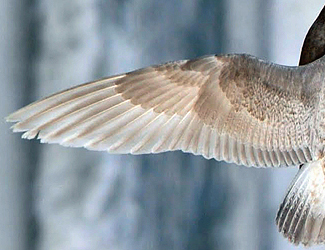 Primaries and secondaries are grey-brown to whitish-buff (concolorous with or paler than upperparts) with broad paler tips, forming pale wing-tip in settled birds; often with narrow dark chevrons near the tip (generally more prominent than in Glaucous Gull hyperboreus). The shafts are white to pale yellow. The darkest-patterned birds may show darker grey on the outer-web of P6-P10 and are slightly paler edge on the tips of P6-P10 (such birds are overall often darker-than-average plumaged and more solid dark on the tail. It remains to be seen if these birds may be intermediates with kumlieni. The ideal pattern (from a American perspective) is of inner primaries which are darker than outer primaries. In fact, the three outermost primaries P8-P10 should be simply white, maybe with just a hint of a dark line along the shaft at close range. In glaucoides, the very tip of the outer-webs are white, with obvious chevrons or ´arrow/head patterns´ on the central and inner primaries. Also, there is extensive spotting just above the chevrons, continuing to halfway the feathers in P1-P3, and less extensive central primaries, but even still obvious on P6. 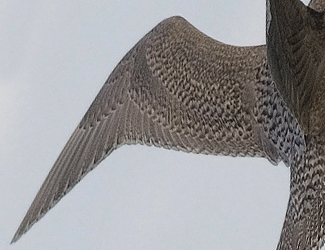 This pattern is copied on the tips of the greater primary coverts, and worth checking, as patterns on exposed primary tips can easily bleach and wear away (making exact valuation of original patterns difficult), while the primary coverts are often hidden in resting birds so patterns are better conserved. Juvenile/first-winter kumlieni is highly variable in wing-tip melanism, which in the pale end of the spectrum reaching similarities to glaucoides, and in the dark end of the spectrum is reminiscent of thayeri. Hence, probably some birds are best left unidentified. But many are obviously darker greyish-brown with more solid dark markings than any glaucoides, especially on their wing-tip. 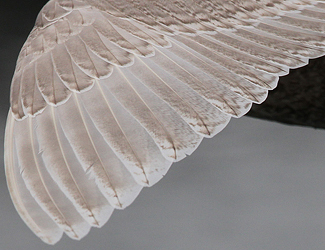 A common wing-tip pattern in kumlieni is a plain brown wash over the centre of the outer primaries and extending almost to the feather tips. The ideal pattern (from a European perspective) is of the outer 5-7 primaries with dark outer webs and pale inner webs and a dark ‘hook-back’ at the wing-tips. These dark outer primaries contrast with less well marked, paler inner primaries. In this pattern it recalls 1st cycle (juvenile primaries in) thayeri. It is most commonly plain, not ‘mealy’ or spotted, although many show a small subapical mark. From February to April, the brown wash and subapical marks (if any present) fade or disappear on many individuals, leaving the outer primaries a rather plain creamy-brown or off-white thereby increasing the number of kumlieni that may be inseparable from glaucoides. Kumlieni has medium greyish-brown outer-webs and dark sub-terminal markings to P6-P10, which, from below, create a brownish trailing edge. From above, the dark outer-webs create a darker outer wing than in glaucoides, appearing concolorous with inner wing and typically plain, with brown wash centred along primary shafts, spreading onto both webs, generally darkest on middle part of outer web. The darkest birds show pale brown or grey primaries with pale tips as in Thayer’s Gull, but often with pale covering the edges, not just the tips as in Thayer’s, which typically has the inner primaries paler than the outer primaries (as broad window). 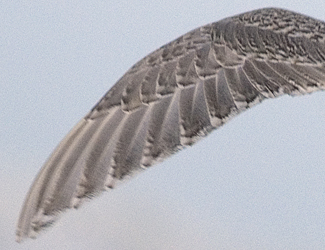 Many have dark V-markings on wing tip, sometimes on all primaries, but in paler birds restricted to P1-P5. Glaucoides has the primaries paler than the rest of upperparts, often uniform (but this can be seen in worn kumlieni from mid-winter), and at most with weak dark chevrons. Kumlieni may show narrow but distinct dark sub-terminal crescents on inner primaries as in juvenile Calidris waders. Sometimes P1-P5 are slightly paler than P6-P10. 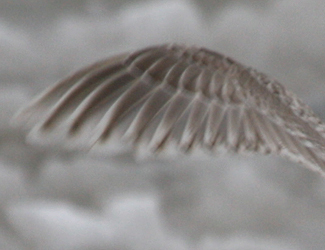 Note that from mid-February the brown primary wash of most kumlieni disappears, leaving the outer wing very similar to average nominate glaucoides. glaucoides, December 20 2011, Neeltje Jans, the Netherlands. Picture: Edward Minnaar. Extensive mottling and lining on rectrices. glaucoides, February 26 2012, Peterhead, Scotland. Picture: Chris Gibbins. Dark bird, but again mottling and lining on rectrices. kumlieni, January 20 2013, Michigan City, IN. Picture: Amar Ayyash. Classic bird with distinct tail-band. kumlieni, December 31 2011, Duluth, MN. Picture: Karl Bardon. Tail-band not as clear-cut, still solid grey reaching feather edges. kumlieni, December 22 2011, Duluth, MN. Picture: Karl Bardon. Grey central patches reaching feather edges. 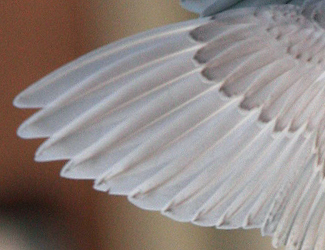 Tail-bar of glaucoides typically consists of narrow bars melting together or much vermiculation, especially along the edges of the feathers. Therefore the tail-band is often not 'as solid' as it is in kumlieni and thayeri. A very plain tail pattern (hardly any internal markings). Normally pale brownish-grey tail-bar or tail-centres with pale mottling on T4-T6 (rarely T1-T3), at bases of most or all rectrices and darker internal markings on midtail; tail-bar contrasts with paler, dark-barred uppertail-coverts. Dark tail-bar present in 15% glaucoides, in 80-95% kumlieni (Zimmer 1991, pers. obs.). Tail-bar of kumlieni often rather uniform, just with faint pale (often broken) mottling at tip of tail and along edges of T1-T2, whereas tail-bar of glaucoides typically consists of narrow bars melting together. Thayer’s usually has darker, mud-brown tail-bar with pale mottling restricted to base and edges of rectrices. Two-toned bill: pale base early in the season. Most kumlieni have black bill with slightly paler brown base, but this becomes gradually paler by midwinter. Small minority have bicoloured bill with pale inner 60%. Most glaucoides have bicoloured bill, some pale with black tip, small minority black-billed. Creamy, buffish. Hwever also sometimes very dark brown. Stronger greyish tinge to generally darker, denser-patterned head and body, including broader, darker spots or sub-terminal crescents on mantle, scapulars and sometimes wing-coverts, sometimes forming irregular pattern. Thayer’s typically darker with broader dark eye-mask and longish-looking lores. Tertials sometimes medium brown with pale spotting or mottling along edges; intermediate between nominate and Thayer’s Gull. Glaucoides (and many kumlieni) have pale tertials with narrow brown bars. In Thayer’s tertial centres more solid mud-brown, recalling pattern of American Herring Gull. glaucoides, December 04 2011, Fraserburgh, Scotland. Picture: Chris Gibbins. No dark secondary bar. kumlieni, January 20 2013, Michigan City, IN. Picture: Amar Ayyash. 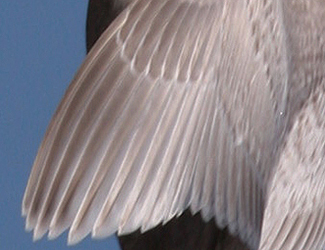 Classic bird with distinct secondary bar, most obvious on innermost feathers. glaucoides, December 03 2007, Scheveningen, the Netherlands. Pictures: Mars Muusse. Darker end of the spectrum, still, no obvious dark secondary bar. Uniform, no darker secondary bar. Darkest birds have slightly darker secondaries in contrast to pale inner primaries and coverts. 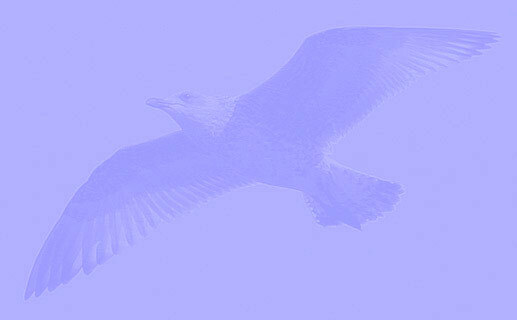 In Thayer`s Gull, contrast is stronger, in nominate absent. Very late, normally completely juvenile until spring. A tendanacy to replace feathers earlier, in winter. The moult into first-winter generally more advanced compared to glaucoides, mantle and scapulars from Oct/ Nov. Fifteen Newfoundland birds Jan-Feb had renewed 10-80% of scapulars, most 40-60% (B. Mactavish in litt.). Iceland Gull (kumlieni) 1st cycle (2CY) F0 January 24 2013, Quidi Vidi Lake, St. John's, Newfoundland. Picture: Peter Adriaens. Iceland Gull (kumlieni) F5 1st & 2nd cycle (2CY-3CY), 2013 & 2014, Quidi Vidi Lake, St. John's, Newfoundland. Picture: Lancy Cheng, Barry Day & Peter Adriaens. Iceland Gull (kumlieni) 1st cycle (2CY) F7 January 23 2013, Quidi Vidi Lake, St. John's, Newfoundland. Picture: Peter Adriaens. Iceland Gull (kumlieni) 1st cycle (2CY) F8 January 25 2013, Quidi Vidi Lake, St. John's, Newfoundland. Picture: Peter Adriaens. 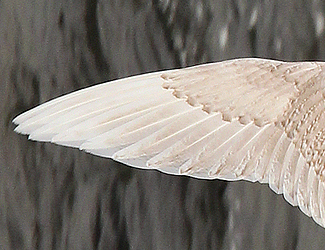 Iceland Gull (kumlieni) H1 1st-2nd-3rd-4th cycle (2CY-4CY), 2013 - 2015, Quidi Vidi Lake, St. John's, Newfoundland. Picture: Lisa de Leon, Lancy Cheng, Alvan Buckley & Peter Adriaens. Iceland Gull (kumlieni) 1st cycle (2CY) H2 January 24 2013, Quidi Vidi Lake, St. John's, Newfoundland. Picture: Peter Adriaens. 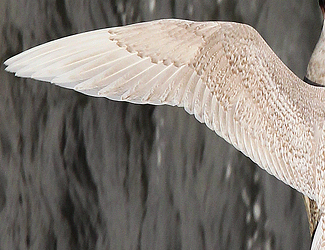 Iceland Gull (kumlieni) H8 1st-2nd-3rd-4th cycle, 2013-2014-2015, Quidi Vidi Lake, St. John's, Newfoundland. Picture: Peter Adriaens, Lancy Cheng & Alvan Buckley. Iceland Gull (kumlieni) 1st cycle (2CY) L2 January - February 2014, Quidi Vidi Lake, St. John's, Newfoundland. Picture: Barry Day & Lancy Cheng. Iceland Gull (glaucoides) 2cy, January 08 2012, Brouwersdam, the Netherlands. Pictures: Kris de Rouck, Edward Minnaar & Pim Wolf. 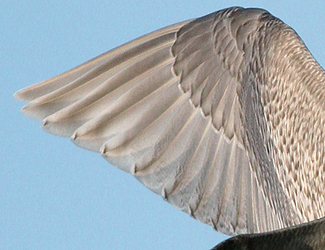 Iceland Gull (glaucoides), 2011-2012, Neeltje Jans, the Netherlands. Pictures: Pictures: Kris de Rouck & Edward Minnaar, Pim Wolf, Marcel Klootwijk. Iceland Gull (glaucoides) 2cy, January 2012, Petten, the Netherlands. Pictures: Jan Stok, Joke Huijser, Folkert de Boer, Hans Brinks, Rob Halff, Ruwan Aluvihare Peter Boltjes, I. v.d. Brugge & Koos Bakker. Iceland Gull (glaucoides) 2cy, January 02-16 2012, Stellendam, the Netherlands. Pictures: Kris de Rouck, Pim Wolf, G. Visser, Marcel Klootwijk & Peter Soer. Iceland Gull (glaucoides) 2cy, January 04-21 2007, Fraserburgh, Scotland. Pictures: Chris Gibbins. Iceland Gull (glaucoides) 2cy, January 14 2007, Fraserburgh, Scotland. Pictures: Chris Gibbins. Iceland Gull (glaucoides) 1st cycle (2CY), January 06 2012, Klaksvík, Faroes. Picture: Silas Olofson. Iceland Gull 1st cycle (2CY), January 06 2012, Klaksvík, Faroes. Picture: Silas Olofson. Kumlien's Gull 1st cycle (2CY), January 23 2013, Quidi Vidi Lake, St. John's, Newfoundland. Picture: Jan Baert. Kumlien's Gull (kumlieni) 1st cycle (2CY), January 23 2013, Quidi Vidi Lake, St. John's, Newfoundland. Picture: Jan Baert. Kumlien's Gull (kumlieni) 1st cycle (2CY), January 06 2012, Klaksvík, Faroes. Picture: Silas Olofson. Kumlien's Gull (kumlieni) 1st cycle (2CY), January 20 2013, Michigan City, IN. Picture: Amar Ayyash.